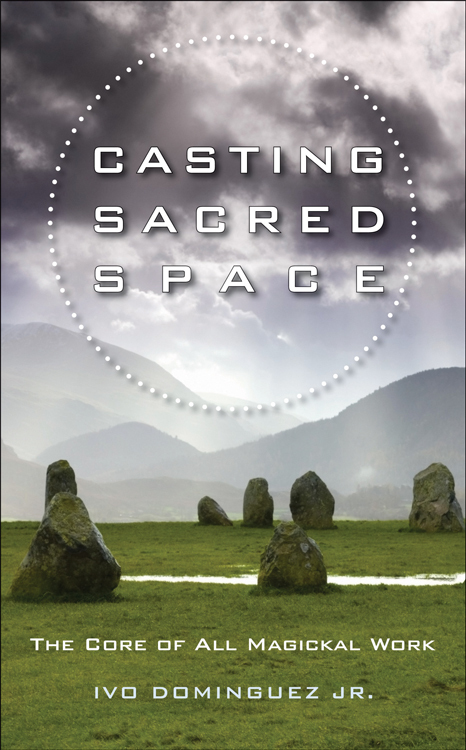 Ivo starts this book by letting the reader know exactly what he what he means by the term “casting” It is seemingly small things like that which mark the professional. Different people may have differing interpretations, but by setting out his definitions he removes ambiguity. How many ways can you think of to create sacred space. Did you immediately think of a Circle? Why? Why not a triangle or a vortex? You may find a need to confront your own preconceptions as you work your way through this book. Make no mistake about it – this a book to be used, not simply read. Without a doubt many, might consider this a beginner’s book. The author spends the first half of the book clarifying terms and concepts before moving into actual rituals and techniques. These clarification, however, venture far beyond those normally encountered in “101” books. There are insights which may surprise many experienced magickal workers. The author has interspersed numerous diagrams, charts, and drawings throughout to help with clear understanding of various concepts. They are simple and easily understood. I am NOT going into a lot of detail in this review. It isn’t really possible to capture the essence of the work laid out herein, and any attempt to do so would not be terribly beneficial. Suffice it to say that, after 4 decades of on again/off again magickal work, I found myself learning a lot, and considering more. The appendices provide “snapshots” of some of the more important concepts as well as the rituals and techniques which are encountered in the man body of this work. It would be possible to simply work from the appendices, but you would be depriving yourself of a wealth of information. No quibbling – if you wish to expand your magickal workings you will want this book on your shelf (or better yet, on your altar).